This is a NEW blog and video post which I hope you will enjoy! It is the first episode of a mini series featuring delicious home made Italian recipes direct from my family home in Italy…! My family has many traditions but one of my favorite, which we are proud of, is called: “Pig Day”. During the year we have a pig growing in my Great Uncle’s farm on my Mums side. He feeds the pig the freshest produce and looks after him all year around so that he is strong and healthy. 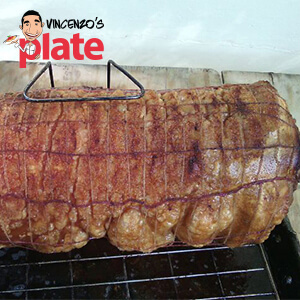 Every December the whole family gets together and creates wonderful delicacies using the main ingredient, pork. Some examples of what we prepare include: Truffle pork sausages, pork sausages, liver pork sausages, “ventricina” (this is a special paste made using a mix of ingredients that is DIVINE spread onto bread like a bruschetta. It is a specialty that you can’t find everywhere….yuuuuuum!) lonza (Capicollo, capicola), salami, the best prosciutto ever and….. our famous Porchetta. There is only one porchetta which we prepare and it’s almost a rule that it can only be cooked and enjoyed one day of the year. The special day happens during Italian summer time and takes place on my Great Grandparents property, the one I spoke about last week, right on the Gran Sasso D’Italia mountains…! Unfortunately my Great Grandparents are not alive anymore but my family still love keeping the tradition going and every single Italian Summer they invite friends and family over for lunches and dinners – particularly this particular one where the porchetta is cooked and shared by everyone! So, recently, my parents organized their annual traditional lunch and invited their friends and family to share the “Porchetta” experience and everyone loved their time there, just like they always do. The highlight of the day is that my Dad cooks the homemade Porchetta in the woodfire oven! The event is getting bigger every year and this year, more than 20 people enjoyed the fresh mountain air, and the delicious homemade meals and treats. 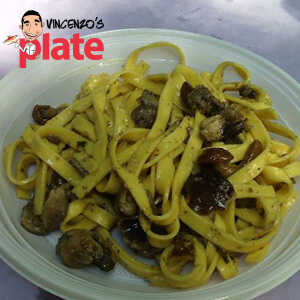 On the menu of the day, Dad also prepares homemade tagliatelle with porcini and wild mushrooms, antipasto platters overflowing with homemade prosciutto, pecorino, olives and bread….and lots of wine and Prosecco! Mum brings along a light, fresh dessert and tells lots of jokes, making sure that every single person is having a great time. Even though I am in Sydney, Australia, very far away from the mountainside of Villa Petto, this is an event that I will keep passing on to the new generations in my family, because it is very important that these sorts of days continue and most importantly, that time is well spent enjoying the best in homemade food, next to many of the people you love. My wife and I loooove organizing these sorts of special occasions and each year I am normally present at this Family event but unfortunately this year we missed out as we didn’t get a chance to travel back to Italy. So, while we were stuck in the cold Sydney Winter weather, they prepared a short video, to show me what they got up to in the beautiful sunshine in bellissima Italia without me! Do you want to see more of my family home videos as they enjoy very yummy home cooked meals? Leave a comment below and let me know. 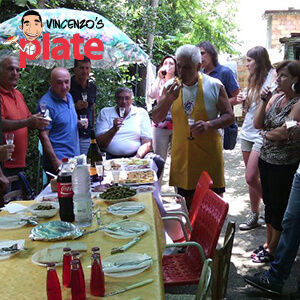 E ora si mangia, Vincenzo’s Plate…. !